MILWAUKEE (AP) — The Phoenix Suns didn’t look like the team with the second-worst record in the NBA in facing Milwaukee. 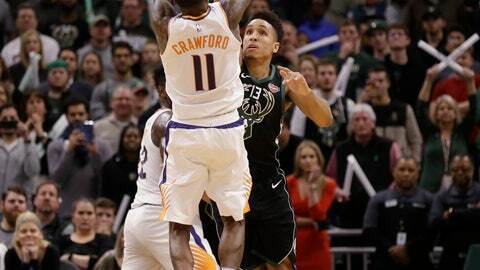 The Suns turned the tables on the league’s second-best team, controlling the game from the outset and withstanding a late rally, defeating the Bucks 116-114 on Friday night on Jamal Crawford’s jumper with 0.8 seconds left. After Crawford’s jumper with Malcolm Brogdon draped on him, Milwaukee called a timeout. Khris Middleton, after a quick head fake, made a corner 3 after the buzzer. The call was confirmed after a brief review. “I hesitated for some reason,” Middleton said.